Happy Canada Day to all of you Canadians reading this! Did you enjoy fireworks? Our kids are still too little, Arianna is actually scared of them, so we just stayed in playing Settlers of Catan with my friend, who now lives with us, and my brother-in-law. It was still a fun way to spend the night. A new month means a new challenge. I wasn’t sure what to do this month, until I thought about the last card I made for a member of my family. It was a birthday card for my dad. He turned 65 last month! I know that masculine cards can be difficult sometimes. So this is the challenge, make a masculine card. If you’re not a card-maker, then make a masculine layout. That might actually be a bit easier! Pewter brads and bitty brads, and hemp. I lifted this card from another consultant, Alisan Smith. She used different colours, but the design is all hers. The finished size is 5×5. If you participate in this challenge, leave me a comment with a link to your post. I’d love to see what you do. Maybe, just maybe, I’ll have a prize again this time. Just a reminder that Saturday is the last day to sign up for the Unique Card Workshops. See post below for more information. Krista this is toooo cute! I am loving this card. 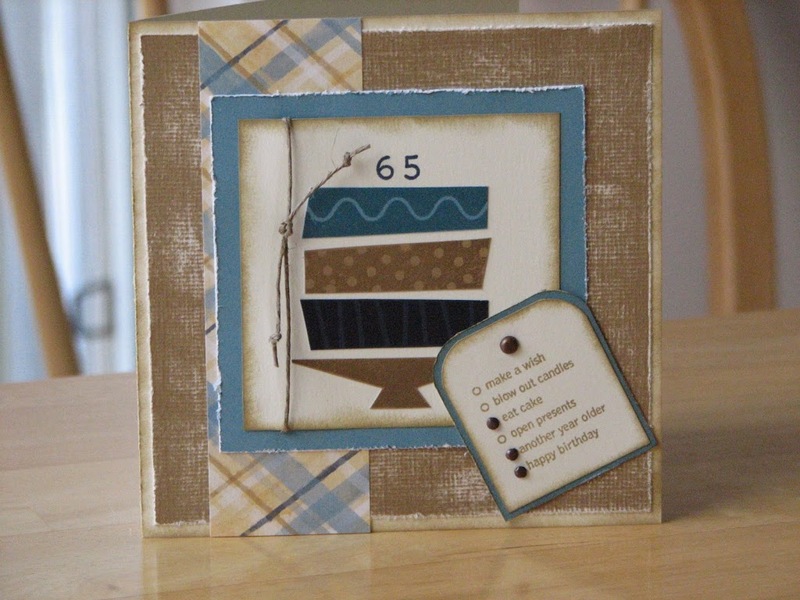 Love this stamp set…love the use of it with Masculine Colors!!! I love this card. I have a brother who is turning 65 in October. I may have to CASE this one. Great job! I hope you will stop by my blog and pick up an award I have for you there.